Another view of Serco Denholm's new crew transport vessel SD EVA, this time seen lying at her berth in the Great Harbour, where she has lain since her arrival a few days ago from Holland. 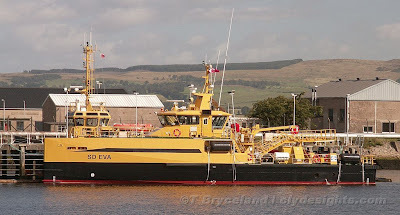 Her arrival meant that so far, of the 29 new vessels being delivered by Damen, six have come to the Clyde - the pilot cutters SDs CLYDE RACER and SPIRIT, the tugs EMILY (now transferred elsewhere), MARS, JUPITER, and now SD EVA. Further deliveries including a new diesel lighter and water barge are expected soon.